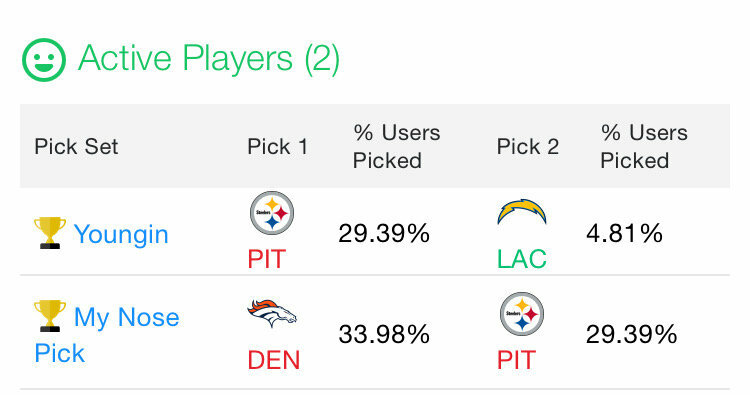 First round of the playoffs and faced Amari Cooper (49.7) and Juju Smith-Schuster (33.0). Still won by 15. Would have won by more had I played Gronk at TE (of course he has a monster game when I finally bench him). Of course. Thankfully my playoffs don't start until next week. I'm on a 3 game losing streak, but still at the top of my league. I had to choose between Amari Cooper, Austin Ekeler and Jaylen Samuels for my flex spot. Cooper turned a great 1st round for me into only a good round. I napped out thinking all three of my big money leagues were good woke up and one was eliminated due to that monster game (Consolation was he won me one of my smaller leagues). Got the one seed heading to the playoffs. Glad the Rams and Gurley (and Goff to a lesser extent) have important real life football things to keep playing for at this point.. So I had Amari Cooper AND George Kittle starting today. Oh , and Patrick Mahomes. That was a lot of points. I don't foresee a 36 point game in Dalvin Cook's future. goodbye, playoffs. playoffs haven't stated in my (keeper) league... someone just made an IR replacement for mark Sanchez... and started him. I know about tanking for next year's draft.... but there should be unwritten rules about some level of decorum and decency. He looks good. Not outside the realm of possibility. I just got over 40 from my tight end. This will be a night. It's possible, but I won't be holding my breath. Would have been a bit more manageable number had I played Wentz instead of Trubisky. Got the #1 seed in my league locked up, but man the Ty Hill injury has me worried. help! I run a pick em league on yahoo where its 1 strike and you are out. this week yahoo requires each member to pick 2 teams. Does Youngin win or do they both play one more week? I absolutely steamrolled my opponent in the first round of the playoffs to the tune of 305.6-235.1 (two weeks combined). He was just 10 points short of being the points leader. So, for the second time in five seasons I've played, the finals in my league is me vs my wife. We have a combined record of 19-7 and mostly dominated all year long. #1 vs #2. She's really good at fantasy football and crushed me in the finals once before. I'm going to give it my all, but she just gave birth to our first child, so I think she deserves to win. @Bacon Congratulations on the new arrival. Made up for you guys. Commiserations on the divorce. But at least you’re a fantasy King right? *PHEW!!!!! Wipes brow ..... with an industrial size mop! I somehow staggered over the paloff line with not only my second straight defeat (100.40- 106.10); but my second lowest scoring output of the season after last weeks pitiful 85.76. NOT the time to be in a tailspin and the worst form of the year! But I’m in so lets ROCK! Won the regular season match-up 115.50- 113.84 vs Betway Boyz back in W5. He’s heavilly favoured for the semi. 9-5. 9 W’s down. 2 to go! I didn't make the playoffs in the ES league, but I outscored 3 of the 6 teams that made the playoffs. It's all about the points against, and all six of the teams that made the playoffs have fewer points against them than I do. 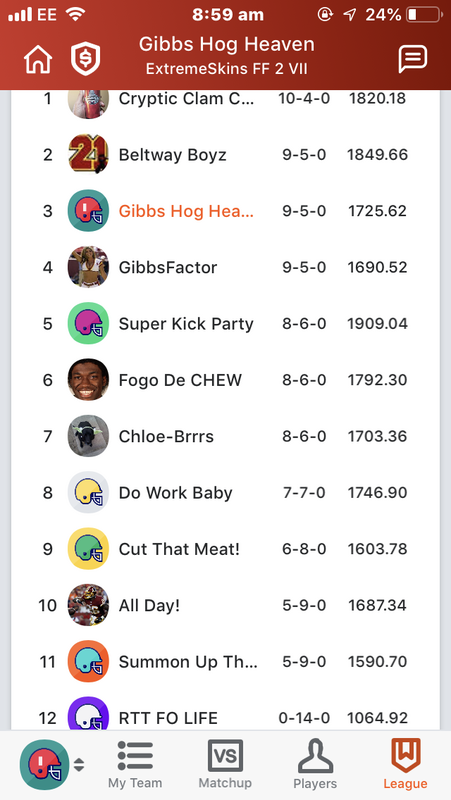 Add insult to injury, with Dalvin Cook's performance last night, I outscored 11 of the 12 teams this week, so I should be gearing up for a deep playoff run. Oh, fantasy football...you bring out the ultra-competitive Type A in me. But so much of fantasy is pure luck and situations beyond our control. 4 team Championship paloff Chewie. Not 6. Planning ahead, I picked up the Rams D when someone dropped em on a bye, and have the Bills too, because I could afford the roster spot after a few injuries. Both are at home this week. I'm leaning Buffalo (v DET) over the Rams (v PHI) Anyone think that's a bad choice? Why I didn't play this year, I proved my point to myself that a ton of effort, like repeated mock drafts in the summer, can get you far, but its still mostly out of your control, why I lost in the championship game last year after getting better and better every year for about three years. I put that time elsewhere, if you treat it like something you do, you miss little **** that costs you everything. If I go all in on something, its not going to be fantasy football, not when you got auto-draft teams in the playoffs and people dropping off giving other teams easy wins, **** from way from me. Trying to beat a team for the 3rd time this year...for the 2nd week in a row in the playoffs. This time it's the juggernaut team that scored 200+ points more than me this year (despite losing to me both times). Now Wentz is likely out...thinking about streaming Carr against Cincy...also maybe benching David Johnson and starting Jaylen Samuels (assuming Conner doesn't play) at Flex rather than TE and moving Gronk off the bench back into TE. Crazy??? Mixon and Chubb are my starting RBs. Thoughts? Where is my thinking wrong? Also, just picked up Damien Williams off the waiver wire. Throw him into the mix somehow. I got Rivers, Hill, Kelce, and Butker. Hoping for a big time shootout tomorrow night. Don’t believe I’ve ever resorted to that before but needs must. Still sitting at 20.73 point (30%) underdog like but F it! Let’s go balls out all in!!!! !